Very proud of my team for this fab experiment from our Creative Lab Fivers. Semi-Conductor puts you in front of your very own AI orchestra. It uses Tensorflow & PoseNet to allow you to conduct music by moving your arms, using only your browser and a webcam. For us, it was a fun experiment in AI and interfaces – how can AI help us interact with computers more naturally? Can we control music the way a real conductor would, instead of with buttons and a screen? You can find it on the Experiments page here, and YouTube here, and here's the direct link. Semi-Conductor was built with beautiful design & UX from Melissa Lu and Haylie Craig, who were absolutely instrumental in the core of the project. This beautiful project is the love-child of Kirstin and JP. What if you had to flee your homeland forever? What's the one item you couldn't live without? The people in this immersive installation were faced with that very decision. Created by SBS' Digital Creative Labs and using technology developed by Google's Creative Lab, Belongings shares tales of displacement, resilience and hope spanning decades of migration, diverse cultures and stages of life. The latest release from our experimental digital book space collaboration, Editions At Play, Breathe is a ghost story that comes to you. It knows where you are, it can see your bedroom and it’s our first ever young-adult book, written by Kate Pullinger. The very strange news that we won a Peabody Award for Editions At Play. Using digital to bring the physical world to life. A write-up and video and repository for our recent project at the British Museum. a collaboration with PunchDrunk and Google’s Creative Lab. The Oracles is a cross-platform experience, developed for primary school children in Haringey. Digital and physical environments are blended, alternating between gameplay and visits to Fallow Cross, where enchanted objects know where you are so that your moves trigger the story. First press from our new exhibit at the British Museum in London. If you'd like more details of the technology behind our exhibit with the and how it can be adapted. We call it xy-fi and conversations are best directed through our tech partner Grumpy Sailor. Story Spheres is a way to add stories to panoramic photographs. It’s a simple concept that combines the storytelling tools of words and pictures with a little digital magic. But also it was used very effectively for smb campaigns in 2015. And most recently it has been adopted by Google's News Lab and is used by journalists and teachers (!) the world over to create their own VR experiences. Most recently AUNZ marketing and press for used it brilliantly to bring ULURU streetviews to life. Go behind-the-scenes at Uluru-Kata Tjuta National Park with Google Maps Street View. Discover Australia's most iconic natural landmark, Uluru, and learn more about the Anangu traditional custodians. Additional thanks to Claire, James and the Grumps as well as Jonny, Jude and Tim in CL-SYD who put so much of themselves into building Storyspheres platform over the past three years. As part of Editions At Play (our ongoing experimental platform to explore possibilities of digital books) these are the questions we got given to answer while developing one of our latest books, A Universe Explodes. Falling in love can leave us lost for words, even though there’s plenty racing through our head. Created by by Google’s Creative Lab and Grumpy Sailor, this quirky set of interactive films allows you to explore the inner thoughts of two characters across a series of serendipitous and sometimes awkward encounters that eventually lead to Love at Fifth Site. Love at Fifth Site allows the audience to use their phone to ‘shine a light’ onto the inner monologue of the film’s protagonists. Using the phone's accelerometer and the browser's native device motion library to respond to audience interaction and movement, the work forms part of an ongoing exploration of how technology can help artists push the boundaries of traditional storytelling. "It’s called The Cube, and it’s a trip. Built by Google Creative Labs as “an experimental platform for interactive storytelling”. It debuted online today with indie dance band The Presets’ new single “No Fun”. You decide what to watch and hear by clicking and dragging The Cube to show a single side or a combination. ACMI's latest VR Commission, Ghosts, Toast and the Things Unsaid is an intimate virtual reality experience that explores the thoughts we don't share, the desires we keep covered and how they affect our relationships. Ghosts, Toast and the Things Unsaid invites audiences into the lives of two characters, Maude and Steve, and into the kitchen where they fell in love and grew old together over 50 years. In the intimate, two-person experience, audiences will choose the ghost they inhabit, then enter into the memory of their character to journey through time, discovering what went wrong in their relationship. The work is a meditation on our propensity to keep secrets, the words that go unheard, and what this means for our relationships. ACMI Director and CEO, Katrina Sedgwick, today remarked on the ability for virtual reality technology to bring live performance experiences to a broad audience. “As VR becomes a new tool for artistic expression we are excited about how leading practitioners who work in live performance can harness it and speak to audiences in new ways on this rapidly evolving platform," said Katrina. “Through our expanding commissioning strategy, along with our co-working space acmi X, ACMI is supporting artists from across the creative industries to explore cross disciplinary collaborations and embrace new technologies to speak to audiences through the moving image." Ghosts, Toasts and Things Unsaid was on show at ACMI from 29 Oct to 13 Nov, 2016. Ghosts, Toasts and the Things Unsaid is an intimate virtual reality experience that invites audiences to become the ghosts of couple, Steve or Maude, and revisit the kitchen where they fell in love, grew old and apart. The work provokes a meditation on our propensity to keep secrets, the words that go unheard, and what this means for our relationships. A collaborative design project with the 20th Biennale of Sydney and local creative agencies, For the People and Grumpy Sailor in May 2016. The 20th Biennale of Sydney featured art from 83 different artists around the world over an 80 day period. History is always a tough subject to bring to life, and even more so when a teacher is trying to transport their students back more than 700 years in time to plague-era Europe. But we had a hunch that technology might be one way to make this subject a bit more participatory. With this in mind, Google's Creative Lab teamed up with Grumpy Sailor to help a class of year 8 students from Bowral ‘video conference’ with 1348, in what we became the first of 5 “Hangouts in History”. A Curiosity of Doubts is a Penguin Special Edition published for the Sydney Writer's Festival. I feel I have somewhat accidentally published a book. Penguin have very kindly included a sort of expanded version of a short lecture I was asked to give (as part of the Sydney Writers Festival). It is a huge honour and I feel a a bit embarrassed to be dressed in the livery of an authentic Penguin Classic, but, at the same time hugely proud. A Curiosity of Doubts is available in shops that sell books. And online. A podcast of the talk is being made and we can link to that. "an immersive performance with 360˚ sound using Google’s invisible, embedded technology." In collaboration with Google’s Creative Lab, Sandpit’s intimate performance features two ghosts (the audience) revisiting the kitchen(s) where they grew up, fell in love and refurbished, over 50 years. Audiences of two will (digitally) tune in to the inner thoughts of a couple at three stages of their life. About: Ghosts, Toast and the Things Unsaid. ".. Google is also interested in this problem of engagement, and cites the declining use of e-readers as evidence that the frontier for digital books has moved. "Phones offer countless new ways to construct narrative and read deeply," says T.L. Uglow of Google's Sydney-based Creative Labs, which created the initiative along with London-based publisher Visual Editions. "These are books that can compete for attention on your phone via incredible, dynamic literature." "If Google sees that you're searching for specific programming terms, they'll ask you to apply for a job. It's wild. Here's how it works." 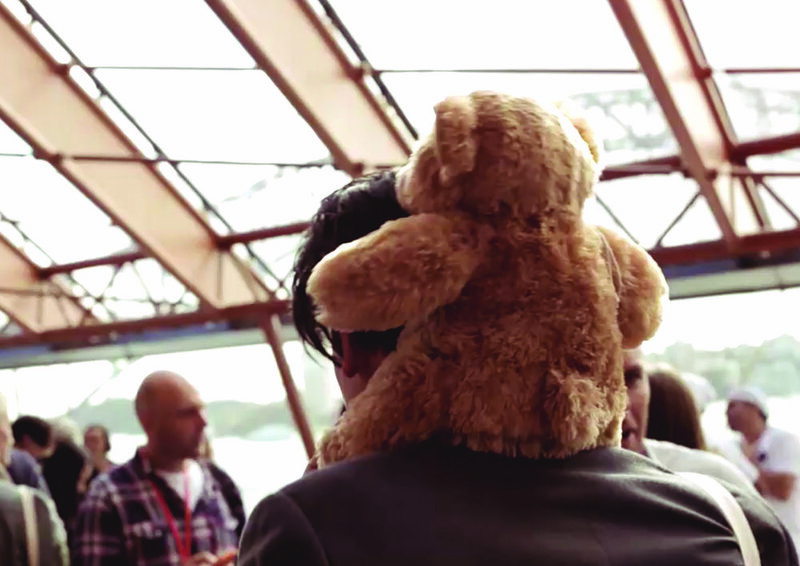 In 2015, in collaboration with Grumpy Sailor, TEDxSydney and the Sydney Opera House, we developed a teddy bear that could talk. In fact, we developed 40 of them. Not only could they talk, these bears could react to their environment, meaning they could tell different stories depending on where they were within the Opera House. Walking around with a TEDdy X Bear is kind of like having a witty, often cute, occasionally rude, teddy bear companion. We created a series of riddles - Our teddies had lost their owners and we asked users to pick one up, walk around and figure out who the previous owner of the bear was. The teddy bears revealed secrets - and little hints - about their formative years. Guess the owner correctly, and a reward was on offer.